The third compiled volume of the comedy manga Watashi ni Tenshi ga Maiorita! released on June 15 announced that the series will be adapted into a TV anime. An official website and an official Twitter account for the anime were also opened at the same time. The original four-panel manga drawn by Nanatsu Mukunoki began serialization in the January 2017 issue of Comic Yuri Hime magazine. Publisher Ichijinsha releases the manga's compiled volumes under the Yuri Hime Comics imprint. Also known by its shortened name Wataten, it is the seventh manga series published in Comic Yuri Hime to be adapted into a TV anime. 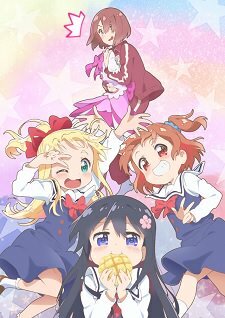 Anime: Watashi ni Tenshi ga Maiorita! Manga: Watashi ni Tenshi ga Maiorita!